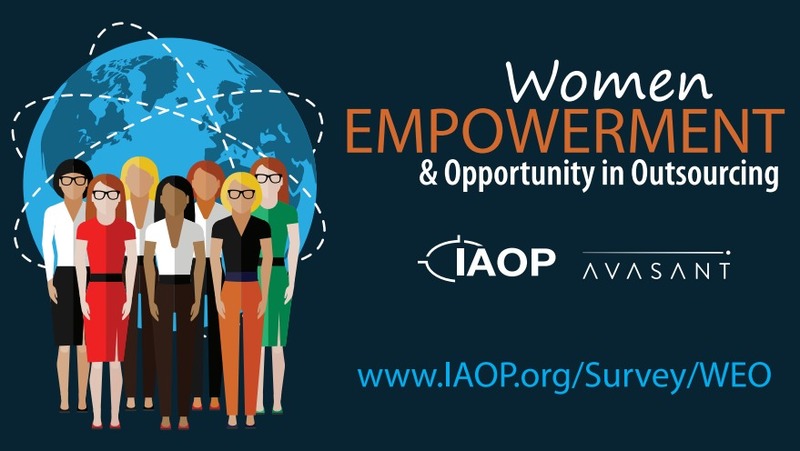 WINDERMERE, FL, May 26 – IAOP, in collaboration with Avasant—a global management consulting firm—announced today, the launch of its Women Empowerment and Opportunity in Outsourcing survey. The purpose of the survey is to gather data on the perceptions of gender equality, empowerment and opportunities for women in the outsourcing industry and identify where and how outsourcing has internationally empowered the lives of women, both inside and outside the workplace. The survey is brief and will be going to more than 50,000 outsourcing professionals around the world. The deadline to complete the survey is August 31, 2016. Findings from this survey will be presented in a powerful main session during OWS17, in February 2017. Participants receive a copy of the results as well as entry into a drawing for seats to OWS17, by submitting an e-mail request at the end of the survey. This initiative does not end with the WEO survey; rather it begins to build the stage to make improvements and bring equality to the workplace in every corner of the world. Following this survey, IAOP and Avasant plan future programs and opportunities based on the results. "The outsourcing industry has historically had an underrepresentation of women in executive and delivery positions,” said Kevin Parikh, Global CEO, Avasant. “At Avasant, we have adopted a hiring strategy to equalize this imbalance. We are thrilled to support IAOP’s WE initiative as a collaborative project partner, a board member and advocate for gender equality." The survey is open to all of IAOP’s global members and affiliates, Avasant’s clients, and all outsourcing professionals across the field and around the world. Though this survey topic is focused specifically on women, everyone is encouraged to participate. For any questions surrounding this initiative or the survey, please contact Dana Corbett, IAOP Director, Research, Training & Certification, at dana.corbett@iaop.org. Avasant is a leading management consulting firm focused on translating the power of technology into realizable business strategies. Specializing in digital and IT transformation, sourcing advisory, global strategy, and governance services, Avasant prides itself on delivering high-value engagements through industry-focused innovation and flexible client based solutions. Visit www.Avasant.com.